Thursday morning driving over 208 bridge...Ice as far as you can see both sides of the bridge. Yesterday [Jan 30th] is Nathan's birthday and he has been celebrating it for many years by spending the day fishing Lake Anna with us. He is an avid fisherman and enjoys the outdoors regardless of the weather. Speaking of weather, we had some interesting challenges to make this trip happen. Last year when we went out it took 4 hours to catch bait before we could even begin to fish so I called Carlos at High Point on Wednesday to see if the ramp was open and it was. We caught some beautiful baits on Wednesday evening and were ready for action Thursday morning. Woke up and it was 1 degree so we decided to meet and hour after daylight to get started. The picture of the lake was taken as I was going to High Point to put the boat in. The lake had frozen completely over night! Two inches of ice prevented us launching there so we got on the phone and went to plan B. After contacting one of our guides [Anthony] we secured another ramp to launch at further down lake. Upon arriving there we were met with 2 inch's of snow and a 1/4 inch of ice on the ramp. Nathan ran to a local store, bought some rock salt and 30 minutes later [10:30] we were in the water. Although we had bluebird skies and the water temperatures had fallen 5 to 6 degrees in less than a week we managed to catch 4 or 5 Largemouth and 7 Stripers. We went downlake to the warmest water we could find but never saw a fish on the depth finder. It looked as though there were no fish in the lake. We set our spread out and simply pulled over all depths of water to catch a few fish. I can't wait for warmer weather to melt the ice so we can get back mid lake and start catching some winter Hogs. I have been off the water for over a month now Hunting and enjoying the holidays and today is my first day back. After seeing the water temperature I knew I had to use some very small baits and fish SLOW so we went and caught bait then looked for some fish. We didn't have long to fish so I concentrated my efforts around the areas where bait was the thickest. 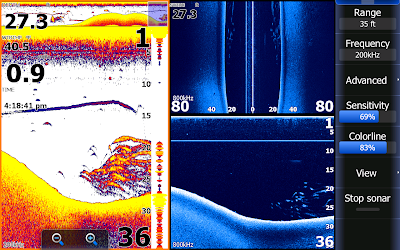 As you can see by the shot of my Lowrance we were working ledges nearby deep water. The line at 15 feet was our downline as it came over a school of very nice Stripers. What happened next was mass chaos. Hard to handle a bunch of downlines hooked up to Stripers over 10 pounds! We caught our limit and came off the water before dark. Not bad for a short afternoon of fishing. I am back in the saddle again and ready to have a great year of fishing for Stripers on the Lake. If anyone is interested in fishing with us this year my grandson's baseball team is raffling off a full day charter with me for up to 6 anglers. You have less than a month to get in the raffle. Details are on my previous post of Dec.16.